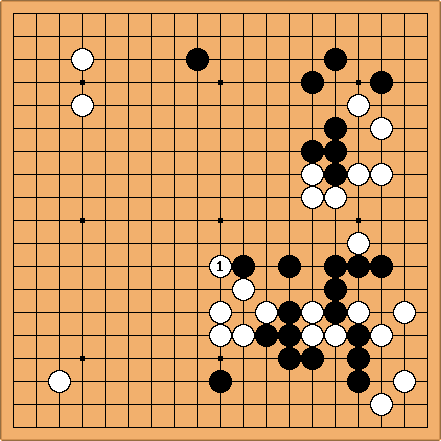 Dieter: Something which continues to bother me in Go Books is the following. In an attempt to explain why a certain move is the best move, the author shows what happens not if one doesn't play there but if one doesn't play at all !! I want to know why that move is better than any other move, not why it is better than passing. I sincerely hope all future authors will dispense with this bad habit. Andre Engels: If it is indeed meant to show why a move is the best move, it is bad. But if it used to show that it is a large move, then showing what happens if one does not play there is exactly the way to do that. More precisely, it shows the value of the move according to deiri counting. Bill: How about an example, Dieter? Thanks. Sometimes an opponent's threat is intolerable. In such a case, leaving out other plays for comparison suggests that no play that does not defend against it is adequate. Maybe that's what is going on. Dieter: I understand that this can emphasize the urgency of the move. In a local context, tenuki exist. 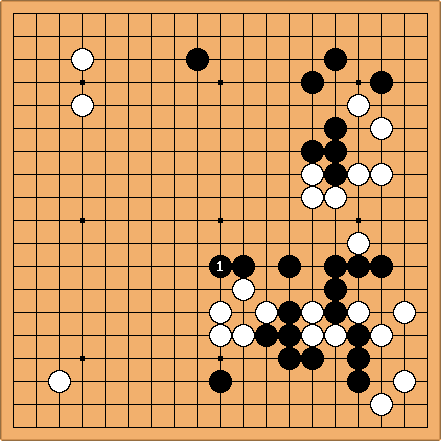 In a whole board context, tenuki equals passing. Even if it doesn't serve the point, I think including a move elsewhere is only fair to the side making the alleged mistake. From Attack and defense - the book by Ishida Akira. "Surely White extended at the bottom or the left or he reduced the top. Sakata however, did nothing of the kind. He defended the center stones." "Black 1 if permitted, would attack both the five white stones below, ..., and the large group on the right side." I would prefer to see this move weighed against one of the jestered suggestions, rather than against a pass. Andre Engels: Just think the move there, I'd say. It doesn't matter to his point where that move is, as long as it's a tenuki. Yes, he could have added some big move elsewhere, but how does that improve the point? Looking at the diagram, one is supposed to realize that this is stronger than a random big point. Which of the big points is actually the biggest is not at issue. We are not comparing to the alternatives, we are not comparing against pass, we are comparing against tenuki. Dieter: If this move is so powerful, then why does it need the absence of the previous move to show its evidence ? The point is: this move is strong, regardless of the previous move. Not displaying the previous move is unfair, unrealistic and unconvincing. Andre Engels: You say that the move is strong, regardless of the previous move. Yet, you seem to be of the opinion that the previous move is important. So what is the previous move according to you? Should we make a diagram for each on the first look reasonable move, and conclude after each, "No, to let black play 1 is too big"? Or should we just add some relatively unimportant stone somewhere and then note, "This is smaller than 1, and I just tell you that all others are as well"? Then you might just as well not show the move and say on beforehand that they all are - which is what is done here. What I'd like to see instead is: "If White plays one of the suggested big moves, such as the shimari of , completely shifts the balance of power to Black. The urgent point of is clearly a superior move to any big move and that is why White should have played there instead." Well, I'm not sure this is the best possible phrasing, but this way one avoids having to counter every single White move and simultaneously avoids pretending there hasn't been any White move. There is a thin line between the above and this one. White 1 is a powerful move. Because, if Black doesn't answer, White can play a. We all know this is awful thinking, yet it suffers from the same illness as the above: pretending the other player won't play. Andre Engels: This is not the same at all. Akira's reasoning is like "After white 1, If black does not answer, white a is a big move, so after white 1, black a is a strong move." Akira is not pretending that black won't play. He is just saying that the same reasoning holds wherever black plays. Dieter= I'm not saying Ishida's reasoning is flawed. I'm saying that an analysis which deliberately forgets to add the opponent's move sets a bad example for the rest of us, with the above kind of analysis as a consequence. It doesn't bother me, for a couple of reasons. First, Ishida does suggest alternate plays for White. True, it would be nice to see how Black responds to them, but it is not necessary. Second, the comparison between and does show how urgent is. is obviously bigger than an ordinary extension or keshi. As Andre points out, this is precisely the kind of thinking that we use to assess the size or urgency of local plays. Applying it to the whole board is really not a problem. A more blatant example would be where White had to prevent Black from killing a 40 point group. You could show White playing somewhere else and Black killing the group, but it really does not matter where else White might play. No need to show that play. Charles I'd say this is a normal technique of 'intuitive' analysis. It says: can you really allow your opponent this key point? Of course one can also ask for concrete variations, and do a proper judgement at the end of them. But (I think) one doesn't play that way, in general. It is a valid teaching technique, therefore, to try to extend the range of examples in which the pupil will say 'of course I don't allow the opponent to play there ...'. This seems particularly appropriate in matters of influence, thought of as power. Dieter: There are many positions imaginable where a certain move looks like the only move. Playing somewhere because disaster will strike if the opponent plays there is the best way to follow the opponent around. If you imagine the effect of a possible tenuki, many of those "only moves" suddenly will look not so important. Only if one can show that an opponent move is disastrous even if you play the best possible tenuki, you understand you can't allow that move. rubilia: I am frequently bothered by the same, and couldn't agree more. Surely, to make a play appear as being the most important one, without actually considering any compensation, can cause the pupil to follow the teacher around, admitting that the particular play indeed is "very" urgent. As long as the pupil didn't see that move at all, this suggestion may enrich his/her view. However, it seems hard to learn whole-board thinking that way. This issue is somewhat similar to Be Fair When Comparing Moves. Charles Dieter's comment does apply to tenuki plays in a meaningful way. For example see 3-5 point low approach one-space low pincer, tenuki. That's a bad tenuki: it probably is the same to say that in a pro game where it occurs you have to look closely at concrete global variations. Is this not equivalent to tewari analysis? It is your move, instead of playing you "bank" your move, the opponent punishes you for your impertinence, you grovel ending in gote, then you get your move back from the bank, up to you to find a big play. Is this not simpler than refuting every play individually? Does this not illustrate which moves are locally relevant?